business, events and other on-site locations. 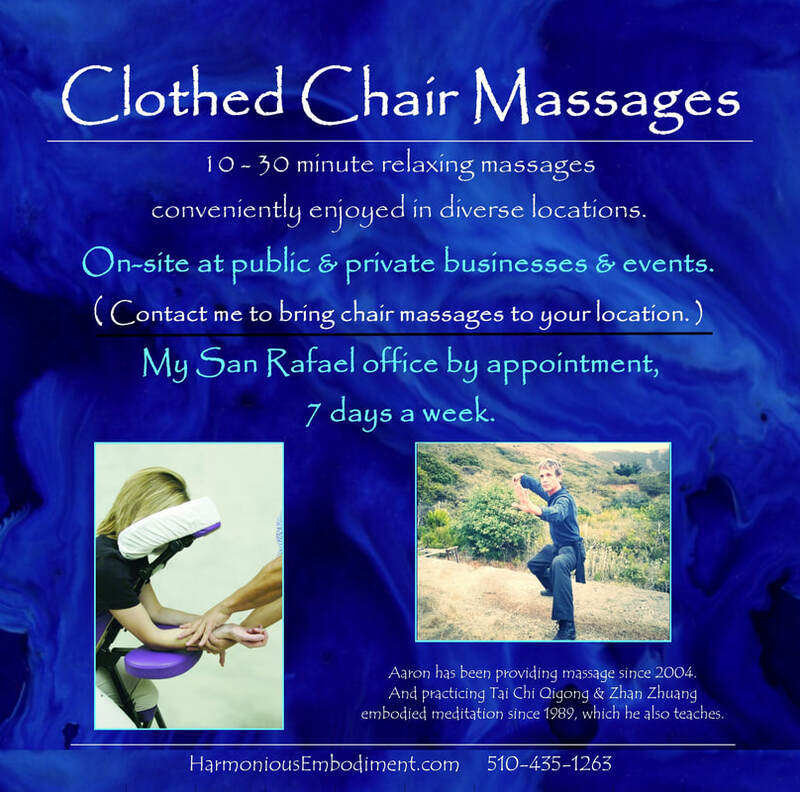 * For on-site chair massages, I bring a specially designed, comfortable massage chair or massage table to your location. And provide 10 - 30 minute, clothed massages per person. At public & private businesses, athletic events, weddings, graduation parties, music & additional contexts. Serving Marin, Sonoma, Santa Rosa, Napa & surrounding North Bay areas. And San Francisco ( with guaranteed nearby parking ) and the East Bay. E-mail or call me at 510-435-1263 ( No telemarketing calls ) to schedule on-site massages at businesses, events & other locations. Please provide your full first and last name and your interest for contacting me when leaving a voicemail or sending emails, for clarity. Rate is $70 - $90 per hour. Rate is dependent on location & frequency of on-site massage visits. you are welcome to receive one complimentary 20 minute chair massage from me as a thank you. ( Your complimentary chair massage is valid for 1 month after referral. in diverse locations & contexts. * Short 5-30 minute massages are easy to include in busy schedules. * Relaxes muscular, mental & emotional tension. * Reduces work related injuries. * Increases ergonomic health & comfort. * Quality addition to events. * Nourishes calm, clear consciousness. ​* Nurtures feelings of appreciation. * Dolls & Dandy in Mill Valley. Providing chair massages during weekends 12:30-5:00 & occasionally additional days. 2016 - Present. * Whole Foods Berkeley - I provided chair massages for 2 years once a week. * Logitech, San Mateo, Ca. * Intel, Santa Clara, Ca. * San Mateo Unified School District, San Mateo, Ca. * Earth Day Green Festival, for the Sustainable Living Roadshows' "Natural Health Farmacy" in San Francisco at Golden Gate Park. * The Yoga Journal Conference at the Hyatt in San Francisco, January, 2007, 2008 & 2009. * Coop America Business Network & Green Festival Conference at UC Berkeley. * Lawrence Livermore Labs, Berkeley, Ca. * The Spice of Life Celebration attendees in Berkeley. * Neocork WineTechnologies in Napa, Ca. * Mill Valley Film Festival. * EarthDance Festival attendees, in Laytonville, Ca. * Techno Tribal Dance at the Harmony Festival in Santa Rosa. * Accentures Escape from Alcatraz Triathalon, in San Francisco. * Kosmos Dance Camp in Saratoga Springs. The preceding list is an example of various types of venues I have provided massage at. I am available to bring professional massage services to similar and other types of businesses and events. Depending on the situation, a massage chair or massage table is utilized for recipients comfort. Fee for services may be paid for by the hosting event or business. Or by individual massage recipients pre-booked & prepaid for depending on arrangements. Send an email or call (510) 435 - 1263 to inquire about bringing on-site massage sessions to your business or event.